Salads don’t have to be boring. The simple addition of sliced apples, crumbled cheese, and candied walnuts make this Apple, Blue Cheese and Walnut Salad our go-to favorite! Salads are often an overlooked part of the menu. 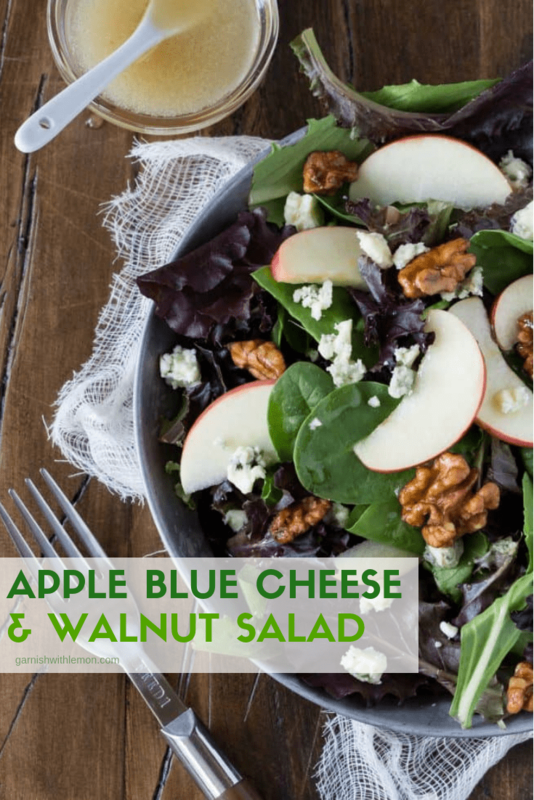 This Apple, Blue Cheese and Walnut Salad recipe has long been one of my favorite salads. One bite and you will understand why this salad makes so many appearances at gatherings any time of year. Blue Cheese and tart apples are always an excellent combination, especially with apple cider vinaigrette and candied walnuts. You get just the right amount of tart, tang, and crunch in every bite. This salad is pretty much a blank canvas just waiting for you to add your own personal touch to it. I often swap the blue cheese for feta, especially when I’m feeding a group. 2) not everyone is a fan of a strong blue cheese. It seems people have a love-hate relationship with it so if I don’t know my guests’ palettes well, I’ll go with the milder flavor. Is there another fruit I can use besides apples in this salad? Absolutely! Don’t have apples on hand? Throw in some dried cherries or craisins. And it’s equally great with pistachios or toasted pecans on top. Basically, the sky is the limit. What makes this Apple, Blue Cheese and Walnut Salad so special? That’s easy, the dressing! The tangy apple cider vinaigrette ties all the flavors together perfectly. And the best part? The recipe makes a lot of dressing so you know you will have extra to eat all week long. 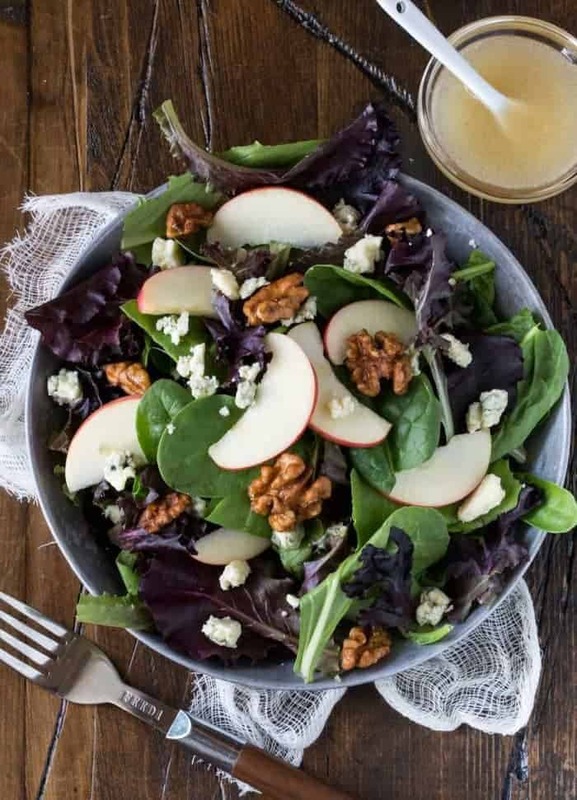 And however you serve it, your guests will devour this Apple, Blue Cheese and Walnut Salad making it a flavorful addition to any entertaining menu! One bite and it will be your favorite, too! Not all salads are created equal! Here are some of our favorite ways to mix it up! This classic vinaigrette is a go-to family favorite! Combine sugar, salt, mustard and vinegars. Stir until sugar is dissolved. Whisk in onion and Worcestershire. Add oil slowly, whisking continuously until mixture is emulsified. Toss together apple slices, walnuts, blue cheese and mixed greens and desired amount of vinaigrette.